It’s no secret that many patients are not happy with their smiles. Crooked, chipped, or yellowing teeth can lower a person’s self-esteem and even make them more reluctant to grin. Veneers are an easy way to eliminate these self-conscious thoughts by improving a person’s appearance. Under the care of Dr. Hanna Mansoor, Gilbert patients can finally get the beautiful teeth they’ve always wanted. Veneers are a painless and simple way to create picture-perfect teeth in as little as two treatment sessions. They consist of thin, wafer-like layers of porcelain that are painted over patients’ teeth. In addition to offering aesthetic improvements, this medical-grade porcelain both looks and functions like normal teeth. Shortened teeth that compromise the smile. Teeth with twists, gaps, or chips. Teeth that are stained or discolored (especially teeth that could not be improved with teeth whitening). Patients seeking cosmetic improvements to their smile will find veneers are an optimal solution for a number of reasons. These are just a few of the many reasons Gilbert area patients should choose veneers from Dr. Mansoor. 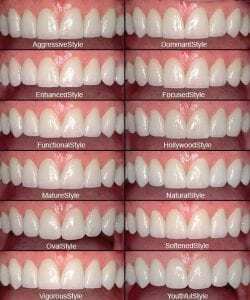 Unlike other oral improvement solutions, veneers are long lasting and durable. Patients can eat foods like they normally do, and with proper hygiene, the veneers should last for 10 years or longer. Unfortunately, natural teeth are not very stain resistant. Dark liquids like tea, coffee, wine, and more can cause irreversible staining with prolonged consumption. Luckily, veneers are made from a highly stain-resistant material that will hold its white color for years to come. Veneers instantly transform a crooked, yellowed, or otherwise unsightly smile into a beautiful work of art. What’s more, because Dr. Mansoor seamlessly attaches each piece, no one will be able to tell the difference between the veneers and the natural teeth. Rather than require lengthy preparation or procedure times, veneers can be completed in just two short visits. During the first visit, Dr. Mansoor consults with patients and takes an impression of the teeth to curate the veneers. At the second appointment, Dr. Mansoor will place the veneers right in her Gilbert office. Unlike other procedures with more painful aspects, veneers are a completely pain-free experience. Patients won’t need to be sedated, but for patients with sensitive gums and teeth, local anesthesia can be applied. What Is the Veneer Process Like? Poor oral health, including gum disease, tooth decay, or infections. Grinding the teeth at night while sleeping (bruxism). Having poor oral hygiene habits, as veneers need to be cleaned just like regular teeth. Larger cosmetic issues, for which Invisalign braces or crowns might be a better option. After confirming the patient is a good fit for veneers, Dr. Mansoor will then use cutting-edge technology to create a model of the patient’s teeth. This helps her design the perfect veneers that will fit the shape and size of the patient’s mouth. To make space for the veneers in the mouth, Dr. Mansoor will have to shave away a small layer of enamel from the existing teeth. This amount is usually less than half a millimeter and provides a textured surface for the new veneer to bond to. 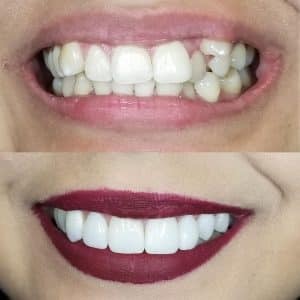 Because the veneers are not created in the Gilbert office, they may take a few weeks to arrive, so Dr. Mansoor will apply a temporary veneer to the impacted teeth to protect them during this period. Finally, on the second visit, Dr. Mansoor will apply the permanent veneers. The new veneers should fit in the mouth perfectly, so all Dr. Mansoor has to do is bond them to the teeth. Once everything is placed, she will perform a thorough inspection to ensure both the look and the fit are appropriate. For patients in the Gilbert, AZ, area, the first step to having a brighter, straighter smile is scheduling a consultation appointment with Dr. Mansoor. At this appointment, she can discuss whether or not veneers are a good option, as well as the results each patient can expect. In just a few simple visits, patients will walk out of the office feeling and looking better than they ever have before thanks to the precision of veneers. To get started on the path to your veneers, schedule your first visit with Smiles By Hanna by calling (480) 279-3700 today. By checking this box you hereby agree to hold Smiles By Hanna, including it’s doctors and affiliates, harmless from any hacking or any other unauthorized use of your personal information by outside parties. By checking this box, you also agree to receive email communication from Smiles By Hanna.